Contactor merupakan komponen listrik yang berfungsi untuk menyambungkan atau memutuskan arus listrik AC. Contactor atau sering juga disebut dengan istilah relay contactor dapat kita temui pada panel kontrol listrik. Pada panel listrik contactor teco sering digunakan sebagai selektor atau saklar transfer dan interlock pada sistem ATS. Berikut adalah bentuk contactor yang dapat kita temui. 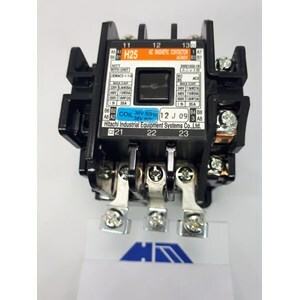 Toko Listrik Murah di Glodok Jual Magnetic Contactor Murah seperti Magnetic Contactor H25 Hitachi serta contactor- contactor merek lainnya: Contactor Schneider LC1D09M7, Schneider Contactor LC1D12M7, Contactor Schneider LC1D18M7, Contactor LC1D25M7 Schneider, Contactor LC1D32M7 Schneider electric, Schneider Electric Contactor LC1D38M7. Overload Relay Schneider: LRD01 SCHNEIDER ELECTRIC, Overload Relay LRD02 Schneider, Overload Schneider LRD 03, Thermal Overload Relay LRD 04, LRD 05 Overload Relay Schneider electric. Magnetic Contactor Mitsubishi, Contactor SN 35, Magnetic Contactor ST 10, Contactor ST 20, Mitsubishi Contactor SN 150, Contactor Teco, Contactor CU11, Teco Cu 16, Magnetic Contactor CU18, Contactor LS: Contactor MC-9b, Magnetic Contactor MC- 12b, Contactor MC-18b, Contactor MC- 22b, Magnetic Contactor MC-32a LS, magnetic Contactor MC-50a LS, MAGNETIC Contactor MC- 100a LS. Magnetic Contactor Fuji: magnetic contactor sc-03 fuji, fuji electric Contactor sc-0, Magnetic Contactor SC-05 Fuji Electric, Fuji Contactor SC-N1, Contactor Fuji SC-N2, SC-N2S Contactor, Contactor SC-N3, Magnetic Contactor SC-N4 Fuji Electric, Fuji Contactor SC-N5, Magnetic Contactor SC-N6, Contactor SC-N7 Fuji, Fuji Contactor SC-N8, Magnetic Contactor SC-N10. Thermal Overload Relay TR-0N/3 Fuji Electric, Thermal Overload Relay TR-5-1N/3. Thermal Overload Relay TR-N2/3 Fuji Electric, Overload Relay TR-N3/3 Fuji. Thermal Overload Relay TR-N5/3 Fuji Electric . Contactor Siemens, Contactor Togami.